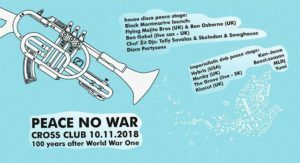 Following events earlier this month, Noise of Art’s next collaborations marking the Centenary of the end of WW1 and the start of post war music and art, takes place on 9-11 November in Prague – capital of the Czech and Slovak nation state created 100 years ago. It features three music and art events and a silent memorial, including the soft launch of Black Montmartre, our project celebrating the start of the roots of modern clubbing 100 years ago. 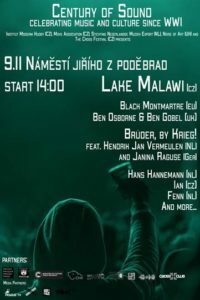 14:00-20:15 Open Air Concert, The Square, Jiriho z Podebrad. Free. 20:00-01:00 After party at Freemasons Club. 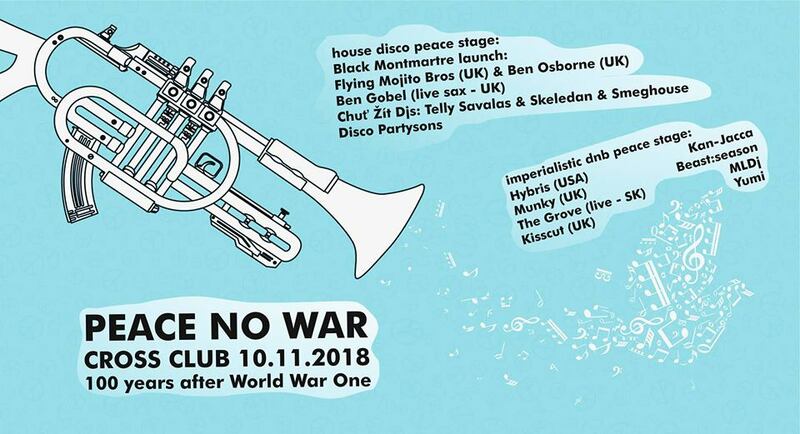 A celebration of the wide range of music genres that have developed and flourished in the 100 years since World War One – including genres such as jazz, rock and roll, psychedelia and electronic music. The music represents the continual interplay between the experimental and street music of Europe and the influence of popular and street music from the USA, especially black music. The night features a rare free performance from Lake Malawi and the first live performance of HJ Vermeulen’s specially composed musical masterpiece ‘Brüder’. Cross Club, & Move Association, Noise of Art, & CHUT ZIT Featuring Black Montmartre Launch event with Flying Mojito Brothers(UK), Ben Osborne & Ben Gobel (sax) Telly Savalas, Skeledan, Smeghouse, Disco Partysans and more. The Cross continues it’s celebrations of 100 years of music and nightclubs since WW1. Tonight is the European launch of Noise of Art ’s Black Montmartre project, a collaborative electronic music project that celebrates the birth of modern clubbing and the the arrival of black American music in Europe as a result of WW1. Tonight features two UK acts. The fast rising Flying Mojito Brothers, who turn 70’s Americana into modern club hits. And an improvised collaboration between award winning Noise of Art founder Ben Osborne and saxophone player Ben Gobel. Cross favourites, CHU? ŽÍT, complete the roster with the ever popular Telly Savalas, Skeledan, Smeghouse and Disco Partisans. Meanwhile an international line-up joins the drum n bass room with Hybris (Pseudoscience Rec., Munky (Druid Rec.) The Grove (live) band! and Kisscut.